Can League of Legends become a lifestyle product? Big investments raise new questions about LoL's future. It is the year 2025. You wake up and blearily check your notifications: a text from a friend, an email, and a reminder that there are some League games coming up this weekend. Cool, you’re looking forward to seeing Dignitas go up against TSM. You get out of bed and grab a bowl of cereal, going online to see what’s up. Hey, there’s a new season of Guardians of the First Star next month on Netflix. Your daughter loves that show. You make a note that you should watch it with her when it comes out. You’ll just have to make time; you need to pick your other kid up from school and he stays late for his collegiate League program. You’ve been playing League on and off for so long that you can hardly remember the early days of Season 2, but you’ve never been able to crack Gold. Your kids, on the other hand, are doing really well. Maybe they’ll join a pick up League, win some prizes. Depending on your point of view, this hypothetical future is either a nightmare dystopia or a perfect utopia—but it may not be that far fetched. League of Legends is being increasingly positioned as a lifestyle product that goes beyond ‘just a game’. While League is going through a shaky period as Riot try to regain trust, the path to this goal is becoming clearer and clearer with some recent announcements. First of all, I’d be remiss not to mention the big stories from the last couple of days: The Philadelphia 76ers have gotten into League, buying both Dignitas and Apex and merging the brands. The 76ers aren’t the first big traditional sports brand to get into esports by a long shot, but this is one of the smartest starts. By buying existing talent and brands, it seems likely that the 76ers (competing under the Dignitas name) will be able to build a strong foundation in the LCS. Apex had a respectable first split, missing out on the playoffs but also avoiding the risk of relegations. Echo Fox and NRG, owned by Rick Fox and Shaq respectively, weren’t so lucky. Both teams were entered into the promotion tournament after a lackluster summer performance. Echo Fox re-qualified, but NRG weren’t so lucky. Another big announcement is that Team Liquid has signed a partnership with an ownership group made up of the owners and co-owners of some big names from traditional sports. Among them are representatives from the NBA, the MHL, and the MLS. Magic Johnson is the most notable figure among them, and while they’re leaving Liquid’s management structure relatively intact, there’s going to be a lot more money and infrastructure in the NA LCS scene as a result. After weeks of stories that made the LCS look like a shaky and unsure investment, this news comes as welcome reinforcement. The LCS is, in many ways, one of the most important parts of Riot’s marketing structure. Even though the amount of money it brings in is uncertain, it’s a priceless investment that brings in interest, builds League as a cultural event, and is a definitive statement about the game’s success. Someone can scoff at a design choice or claim that the game just isn’t what it used to be, but it’s hard to argue with a sold out stadium of thousands of fans. Rivalries is a new program that expands the collegiate scene. The premise is simple: fans vote on rivalries, and then the chosen teams go head to head in a series of showmatches. While it’s a simple premise, it’s super exciting for a couple of reasons. The first is that Yahoo! 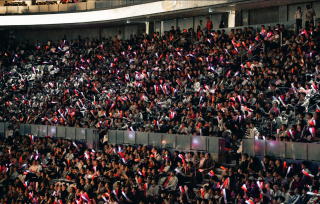 Esports will be partnering with Riot to showcase the Rivalries show matches, providing on and off-site coverage. Riot has worked with media before, but Rivalries takes that a step further. Yahoo! Esports will be able to cover the collegiate matches and provide a good ‘jump on’ point for students interested in League who are familiar with the game but haven’t made the jump into engaging with the game on a deeper level. The second point is Riot’s attempt to build collegiate communities. Rivalries is just part of Riot’s efforts to have communities built around League. Not only should League be an esport, but it should also be a place to gather, meet friends, and spend your time. You can meet friends who are into League, play together, maybe even compete at a semi-professional level, and then get together on the weekend to play Mechs Vs. Minions. If executed well, the League ecosystem should start to extend beyond just the game itself. Riot has proven that they’re able to expand their world in unexpected new directions. They’re building rich worlds within their world: A Magical Girl anime, a sleek science fiction dystopia, a gorgeous fantasy setting. The Mechs Vs. Minions board game proves that they’re able to branch out, and League itself is still an extremely relevant game at 103 active million monthly players. Maybe my hypothetical vision of the world in 2025 will come true. Perhaps these efforts will only be successful for a relatively short time, or burn out altogether. There’s also the possibility that there just isn’t that much appetite for this much League. There might be a quotient of how much Lux and Jinx someone is able to have in their life. Even massive successes can cause burnout in audiences. It is true that if Riot are able to offer a diversity of experiences, this will reduce the risk of a bored audience. This is going to be a make-or-break period for League’s ambitious long-term plans.